← How Sweet the Sound. It has been a while since I last posted an update on Carson. We have had a pretty long gap between major appointments. Since my last post we have learned a little bit more about Carson and added a few more pieces to the puzzle. Last March (as in March of 2014) Carson’s geneticist ordered an MRI to try and get an idea of what mystery disorder Carson has. We were referred from genetics to neurology and the MRI was scheduled for March 3rd. We never received a phone call about his MRI so we just assumed no news was good news. We went an entire year thinking this was the case. It was not until an appointment to discuss Carson’s hypotonia and spasticity with a specialist that it was brought to our attention that Carson’s MRI was actually abnormal. Some how there was a miscommunication somewhere and we were never notified. We were told that Carson has thinning of his corpus callosum (the part of the brain that connects the right side and the left side). Of course the first thing I did when I got to the car was google. Thinning of the corpus callosum can be caused by a slew of things. More than likely Carson’s was caused by his mysterious genetic disorder. There are varying degrees of severity. It can cause complete mental retardation and physical dependence, less severe symptoms, or no symptoms at all. Chances are some of you reading this have thinning of the corpus callosum you just don’t know it. Some common symptoms associated with this include: visual impairments, hypotonia, early feeding difficulties, high tolerance to pain, hearing impairments, chronic constipation, delays in attaining motor milestones, early speech and language delays, poor motor coordination, and an overall happy disposition. Anyone who has ever spent any amount of time with Carson knows that these symptoms are pretty much the definition of Carson. Because this has to do with how Carson’s brain developed in utero there is no way to treat the actual thinning of the corpus callosum itself. 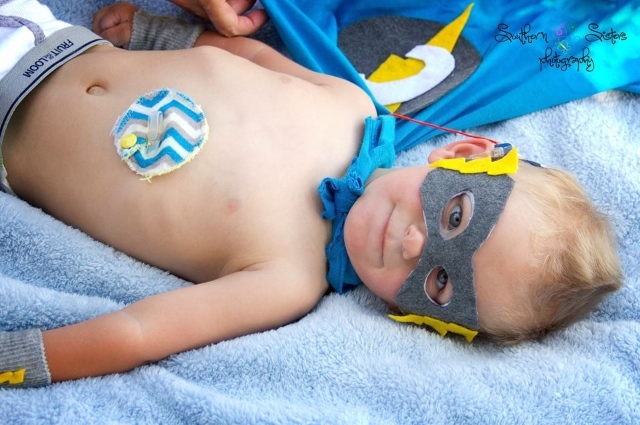 All we can do is try to treat the symptoms with things such as his cochlear implant, physical therapy, gait trainer, speech therapy, and glasses. Which leads me to my next update. We have known for about a year that Carson can not see as well as he should. However, it was not until last Wednesday that we learned just how severe Carson’s vision impairment is. Some of you may have noticed either in face to face interaction with Carson or in pictures that sometimes it seemed like one or both of his eyes were almost crossing. This is called strabismus. Carson’s ophthalmologist confirmed that he does in fact have strabismus and we are not all crazy. He also said that anything that Carson sees, both near and far away, is most likely blurry and distorted. In other words he probably laughs at all of us because we in fact have four heads in his little world. We went to ophthalmology in February of 2014 to rule out a genetic disorder and since the last visit some of the nerve fibers on Carson’s optic nerves have died. This is rare in someone Carson’s age who was not born with it, but of course that is how Carson rolls. Once the damage is done it cannot be reversed. We do not know why he has lost some of his nerve fibers, and we don’t know if he will continue to lose more. We are meeting with his geneticist again on Friday, so hopefully she will have some ideas to look into. For now the course of action is glasses. This should help him see while also correcting the strabismus. We ordered his first pair of glasses last thursday, and they will be here in 2-3 weeks. We are now up to three artificial body parts (he just wants to be ironman). I’m just hoping ironman will be able to keep his body parts on. We aren’t so good with our ear yet, and hopefully adding glasses to that won’t make it worse. All we can do is keep our fingers crossed and invest in a lot of tape!